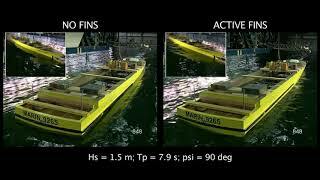 The tank test was performed for a 163 meter yacht that was fitted with a Maglift zero speed model. 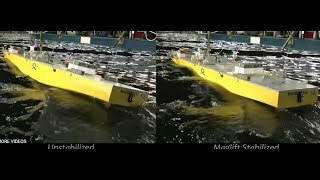 This video is at ship speed and is slowed down intentionally to demonstrate the full scale roll period, not the model roll period. 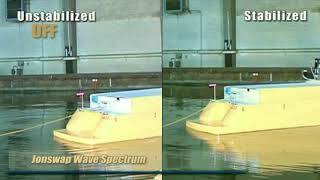 It does not alter the test results, but is used to demonstrate, more clearly, the effectiveness of the stabilizers on a real ship. 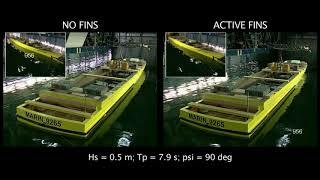 This MARIN comparison video clearly shows the results of active fins when compared to a no fin situation. 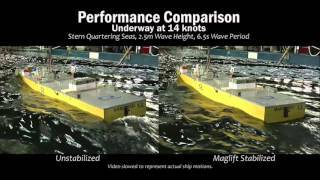 Comparison of Quantum Maglift rotor stabilized and unstabilized ship roll motions in stern quartering seas. 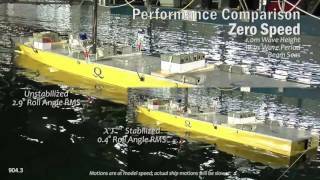 Model tests performed at the MARIN model basin facility on behalf of Quantum, home of Zero Speed(tm) and OnAnchor yacht, military, and commercial vessel roll stabilization system. 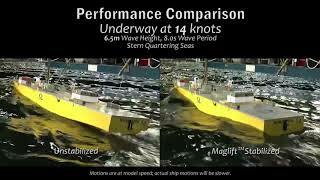 Comparison of XT fin stabilized and unstabilized ship roll motions in 1.0 meter, 10.0 second beam seas. 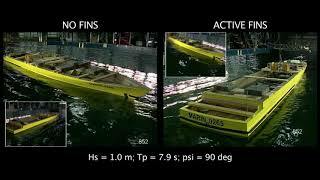 Model tests performed at the MARIN model basin facility in December 2015.